IC Insights recently released its Global Wafer Capacity 2019-2023 report that provides in-depth analyses and forecasts of IC industry capacity by wafer size, by process geometry, by region, and by product type through 2023. The newest edition of the Global Wafer Capacity report shows that 300mm wafers took over as the industry’s primary wafer size in terms of total surface area used in 2008. Furthermore, the number of 300mm wafer fabrication facilities in operation continues to increase. With nine new 300mm wafer fabs scheduled to open in 2019, the worldwide number of operational 300mm wafer fabs is expected to climb to 121 this year (Figure 1) and grow to a total of 138 fabs at the end of the forecast period. At the end of 2018, there were 112 production-class IC fabs utilising 300mm wafers (there are R&D fabs and several high-volume fabs around the globe that make ‘non-IC’ products using 300mm wafers, but these are not included in the count). 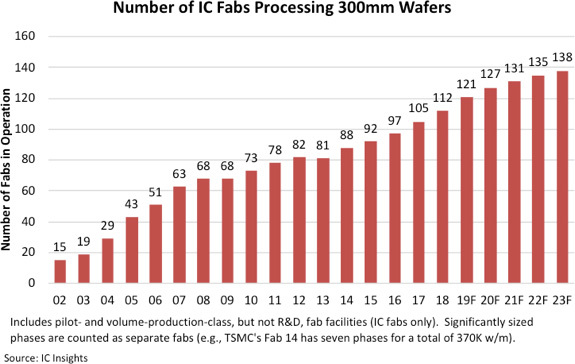 By the end of 2023 there are expected to be 26 more fabs in operation than in 2018, bringing the total number of 300mm fabs used for IC production to 138. For comparison, at the end of 2018 there were 150 volume-production 200mm wafer fabs in operation (the peak number of 200mm fabs was 210).